"With over 1000 slots in their portfolio from over a dozen acclaimed software providers, Jetbull Casino is a must for all slot lovers." Jetbull Casino may have a bull in its logo, but its behavior is strictly professional and not at all animalistic. The brand was launched in 2007 and in several years Jetbull became one of the biggest internet casinos in online gambling history. 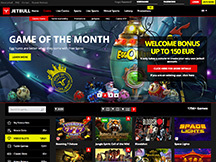 The website runs on a multi-software platform powered by EveryMatrix and hosts over 1500 games that are broken down to numerous categories like video slots, movie slots, table games, video poker, scratch cards and jackpot games, among others. Jetbull.com offers mobile games and live dealer games as well, while maintaining a high standard in customer service. Multiple ‘Best Customer Service 2014’ awards are proof that people at Jetbull Casino are doing a splendid job at pampering their customers. If you join Jetbull Casino you’ll have the chance to scoop their welcome bonus of a 100% deposit match up to €150. As a regular customer you will be entitled to a €35 reload bonus every week, as well as hundreds of free spins if you transfer your play to the mobile version. You can also get free spins over the weekends, and win more rewards by playing the Game of the Month. With over 1000 video slots on display at Jetbull Casino, it’s extremely hard to extract several representative titles and point them out, but here goes nothing. If we stick with the popularity label, titles like Divine Fortune, Gonzo’s Quest, When Pigs Fly (NetEnt), Gold Lab, Phoenix Sun (Quickspin), Immortal Romance (Microgaming) and The Slotfather (Betsoft) come to mind. The Jetbull casino lobby includes an impressive assortment of table games, video poker machines and instant scratch cards. Feel free to try out Suit‘em up Blackjack, Buster Blackjack, Double Ball Roulette, Sic Bo or Pontoon. The video poker selection includes exclusive titles like Wild Sevens and All American Double Up. Depending on your country of residence and your preferred currency, you’ll be able to choose from a wide array of payment methods at Jetbull Casino. Accepted banking methods include Visa and MasterCard, Skrill, Ecopayz, Paysafecard, Neteller, Trustly, Giropay and many more. Processing periods vary from instant to 3-5 days for traditional bank transfers. If you enter the Casino Cash Rewards loyalty program at Jetbull, you can earn more cashback on your casino bets regularly. Just place real money bets and you’ll earn Frequent Player Points (FPP) on all games, but note that different games generate points at different rates. The gist is you can exchange points for cash and have them credited to your balance. Pay attention to special FPP promotions that allow you to gather points at a faster rate. The main benefit of Jetbull Casino is its immense game selection from over a dozen acclaimed software providers. The website is licensed by the government of Malta and offers seamless instant play across all devices. Jetbull Casino delivers tailored promotions and high profile customer service, making it one of the most attractive virtual casinos on the web. Are you ready to play at Jetbull Casino?